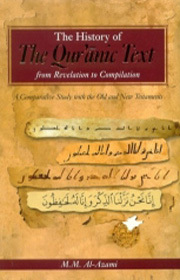 The History of the Qur’anic Text from Revelation to Compilation : A Comparative Study with the Old and New Testaments. The Qur’an reigns supreme in Muslim hearts as the most sacred of texts: a profusion of exalted ideas to rouse the mind, noble histories to stir the soul, universal truths to awaken the conscience and precise injunctions directing humanity to its own deliverance, all distilled into the melodious essence that is the Word of Allah. Through fourteen centuries Muslims have persevered in championing the text against corruption, memorising its every word and contemplating its every phrase, so that in our own times untold millions have enthusiastially committed each letter to heart.